When you create a dashboard in Zendesk Explore, by default only you can see it. 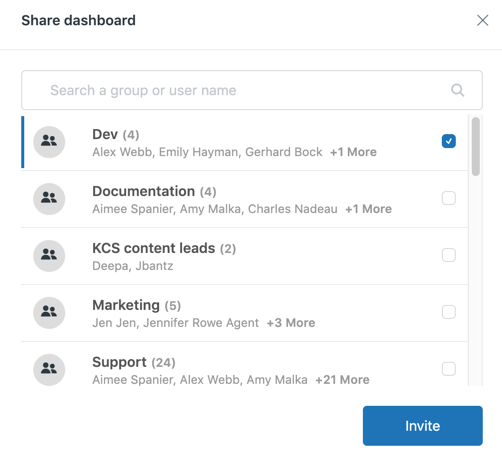 In this article, you'll find out how you can share dashboards that you and others created, and use the Publish command to keep the shared dashboards up-to-date. When you share a dashboard with a user who has the viewer role, they can see, and interact with the dashboard. If you share the dashboard with a user who has the editor role, they will have full access to the dashboard. Individual users, or users in groups you added will receive an email invitation to view your dashboard. You can also schedule shared dashboards to be delivered on a regular basis. See Scheduling dashboards through email for more information. Note: When you make changes to one of your dashboards, the changes are not automatically re-shared with users. You must Publish the dashboard to enable users to see the latest version. Note: You cannot schedule dashboard deliveries to light agents. You can share a dashboard while it is open, and you are editing it, or directly from the dashboard library. Open the dashboard you want to share. The dashboard opens in preview mode where you can click Share. 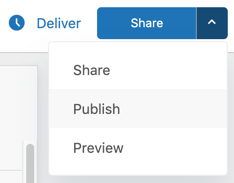 You can click Edit if you want to make changes to the dashboard before you share it. When you are ready to share the dashboard, click Share. This menu appears only on dashboards you created. From the Share dashboard page, choose the groups or users you want to share the dashboard with, and then click Invite. Only users and groups that have been added to Zendesk Support can be shared. You can share a dashboard directly from the dashboard library without opening it. 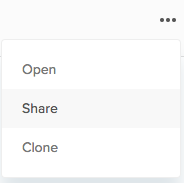 In the Dashboards library, click Share from the settings ( ) drop-down list to the right of your dashboard's name. When you publish a dashboard, this updates shared users with the latest version of it. In the Dashboards library, click the dashboard you want to publish. This must be a dashboard that you created, or cloned. In the dashboard, click Publish. You can also click Preview to see what shared users will see in the dashboard. The next time users look at the shared dashboard, they see the latest version. Is there any way to share the dashboards via email to external email addresses. I have some customer specific dashboards that I need sent out on a monthly basis and these need to go to people who are not agents or don't raise tickets in Zendesk. At the moment there isn't a way to share dashboards with external parties. As a workaround you can export the dashboard and then send the file on from there. There is also currently a feature request in our help center requesting that particular feature and I highly recommend you head to that post to up-vote and share your use-case to help influence the future functionality of Explore.